Adding ferries companies (P.E Ferries, DFDS) and Eurotunnel, that are yearly more than 20 millions of passengers travelling via Calais, the main spot to cross between the European Continent and Great Britain. Ferries have provided regular trips to/from the ports of Calais and Dover since the start of the 19th century and the packet boat era. Two car ferry companies provide the crossing: P&O Ferries and DFDS Seaways. Ferries transport vehicles and passengers on the 90 minute trip day and night. You can with P&O Ferries. TAD stands for Transport on Request. A shuttle bus takes foot passengers from the ferry terminal to Calais town centre. 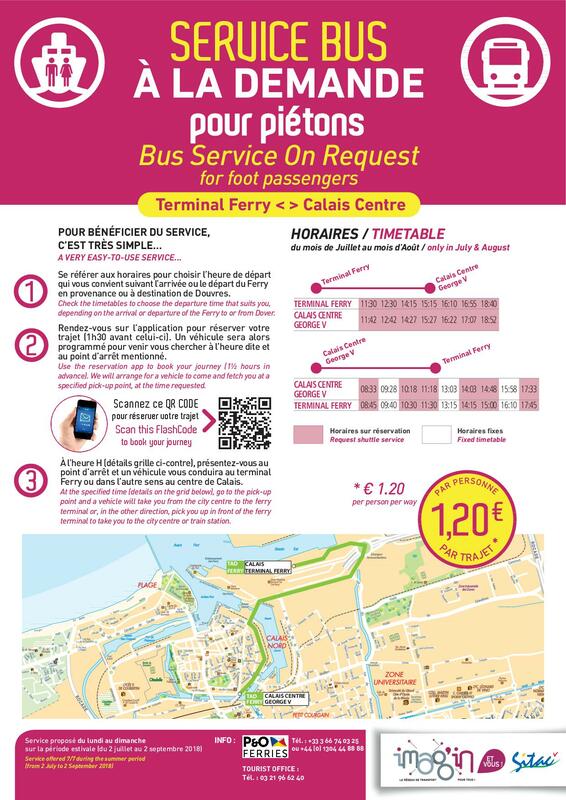 Calais Opale Bus is once again putting this line in service for the summer period (1st July to 31st August), in partnership with the shipping company P&O Ferries, the only cross-channel operator that takes foot passengers. The bus runs if it has been booked in advance. Booking can be made either at the P&O Ferries check-in desk in the Dover terminal building, or at our tourist office reception desk via the application Zenbus, which you can download on to your mobile or use on a tablet installed for public use in the tourist office.